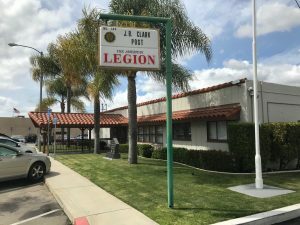 Post 149 is located near downtown Escondido, California at 230 E Park Avenue, between the Park Avenue Community Center and the National Guard Armory, across the street from Food-4-Less. From Interstate 15 North or South bound, take Route 78 East to the end of the freeway at Broadway. Turn South (right) on Broadway. Go through the next traffic light (at Mission Avenue) and turn left at the next block (Park Avenue) just before the Food-4-Less. We are on your left, about one block down, next to the National Guard Armory. You can park in front of the post or behind the community center.